Camping ‘Au Bois Joli’ is located in Burgundy, in the south of the department ‘Yonne’, 40 kilometres to the south of Auxerre (pour avoir l’air d’être de la région, faites comme les Auxerrois, oubliez le -X- et prononcez -Ausserre-). The camping site is on the borders of the winegrowing region ‘the Chablis’, ‘Auxerrois’ and ‘Vézelay’ and close to The Regional Nature Park ‘the Morvan’, an area of natural beauty, where you can see the fields with the ‘Charolais’ cows, which are kept there. Because the camping site is situated centrally and easily accessible, it is a good starting point for all sorts of trips in the surrounding area. The terraced camping site is situated on a hillside, so you can enjoy the wonderful view over the hilly landscape. During the evening, the camping lies in the beneficent shadow. The site is kept as natural as possible, with large pitches in a woodland area. You’l; find a rich diversity of birds, butterflies, mushrooms and wild fruits like blackberries, wild strawberries, hazelnuts and wild flowers, including 15 different types of orchids. Our maintenance of the site is aimed at to give a chance to nature. The campsite is situated just outside ‘the Morvan’ in the basin of the Yonne. 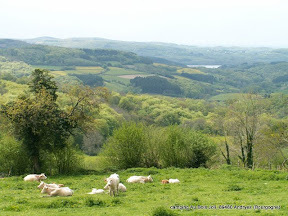 Compared with the Morvan, the climatic differences are large. The hight of the hills in the Morvan (till 900 meters) has clearly affect the amount of rain which falls over there. 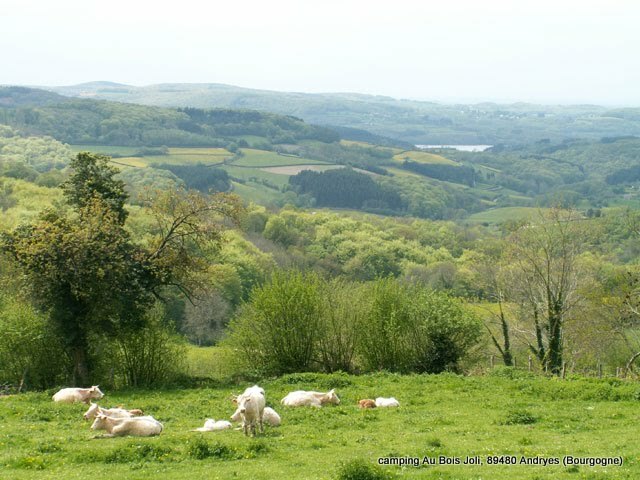 That’s why in the Morvan you’ll find green pastures with cattle, in the Yonne, the climate is such that the grass is not green enough to keep cattle. Historically, the Yonne was an area with lots of viticulture. At the end of the 19th century, when much of the vineyards had been destroyed by phylloxera, one is more and more gone over to cherry growing and cultivation. Fortunately, the viticulture has quite recovered during the 20th century and the wines of the Yonne, such as Chablis, Irancy and Coulanges la Vineuse known and loved. How to find the campsite? When coming from Auxerre, you take the N 151 (Bourges). In Coulanges-sur- Yonne you go to the left near the traffic light, and take the D 39 to Andryes. After about 3 Km in the centre of Andryes (just before the church) you take a sharp left-hand turn and then go in the direction of Villeprenoy. Follow the road until you arrive at the camping site after about 500 meters. When coming from Nevers (the South), you take the N151. In Coulanges-sur-Yonne you go to the left near the second traffic light and take the D39 to Andryes. Than follw de signs ‘campsite’. Clic here for a map.